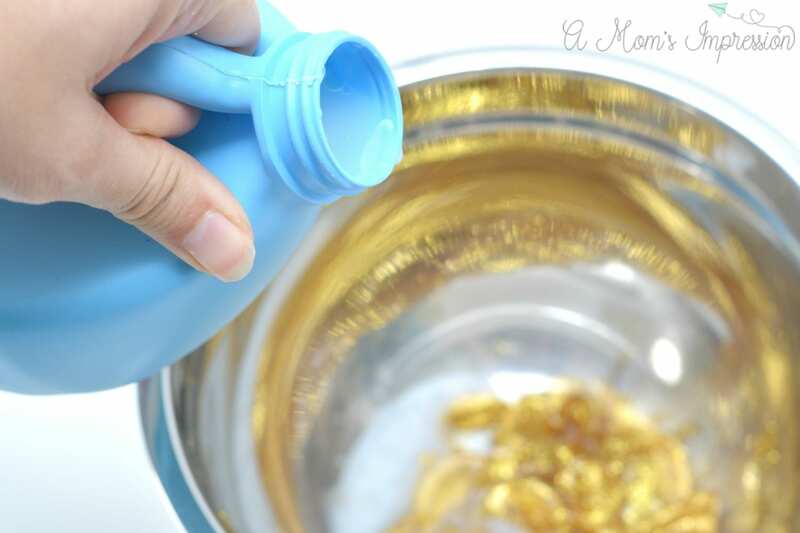 This fun gold glitter slime recipe is simple to make in minutes and is made without Borax. Using just 2 ingredients, even your littlest one can help in the fun! Have you joined the slime making craze? Chances are that if you have kids, you have made your fair share of slime. 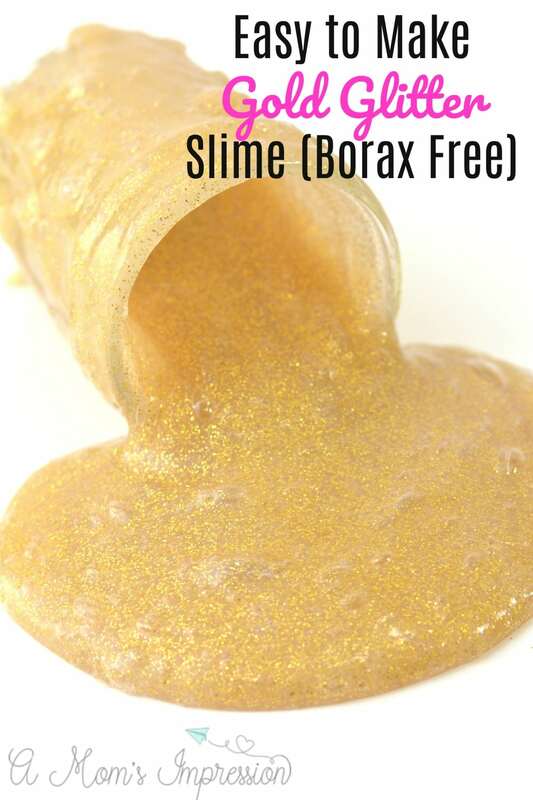 There are so many ways to make slime, from using contact solution, Borax and liquid starch. You can even make slime out of soap! Check out our list of creative slime recipes for more ideas! My kids’ favorite type of slime is glitter slime and thank goodness because making glitter slime is pretty easy. 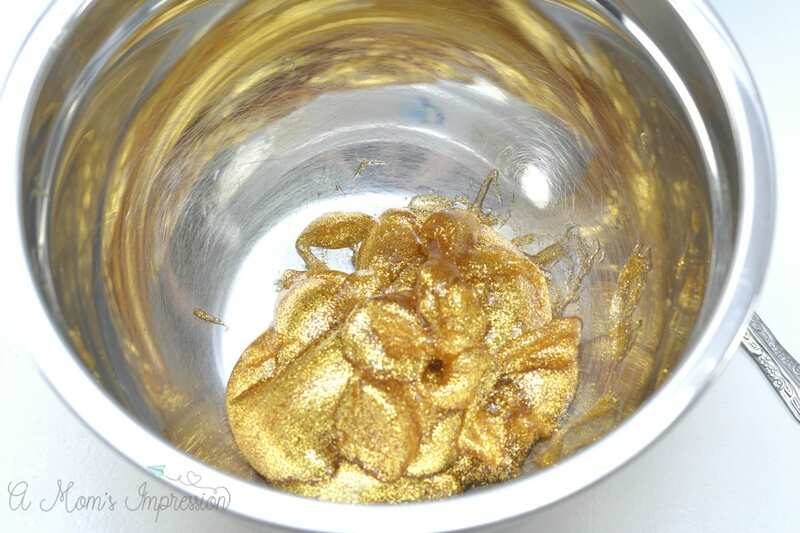 Recently we made glitter gold slime and it was so much. 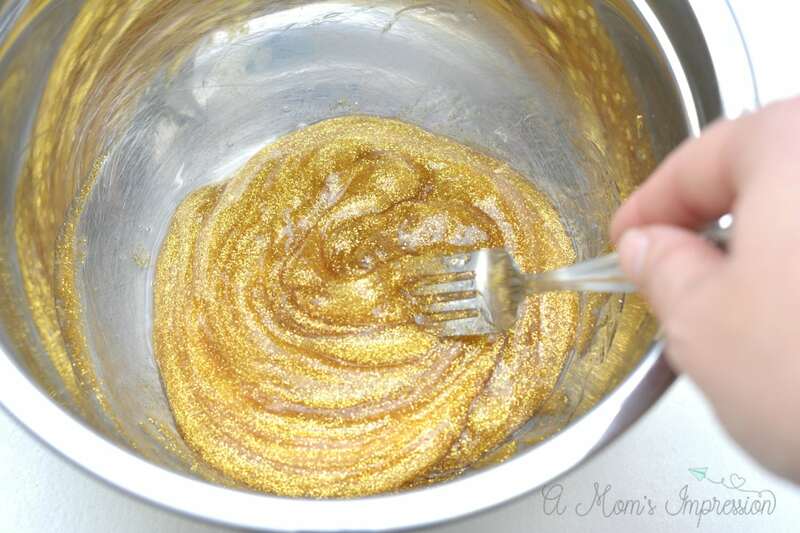 The secret on how to make glitter slime is to use glitter glue! Check out our quick little video for a sneak peek! 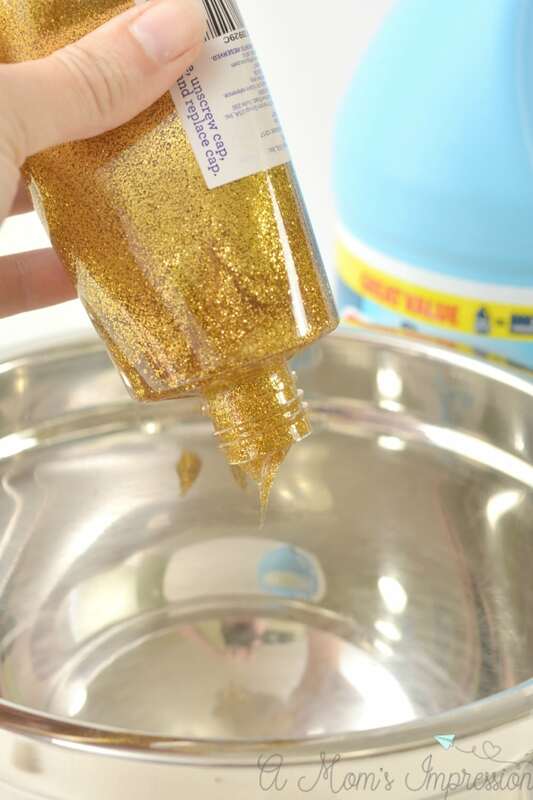 Begin by pouring the entire contents of a bottle of gold glitter glue into a large bowl. Slowly add in a tablespoon or two of liquid starch to the bowl at a time. Stir the mixture well with a fork each time more liquid starch is added. Using a fork to stir the mixture will help break up the glue, and allow the starch to really get into it. 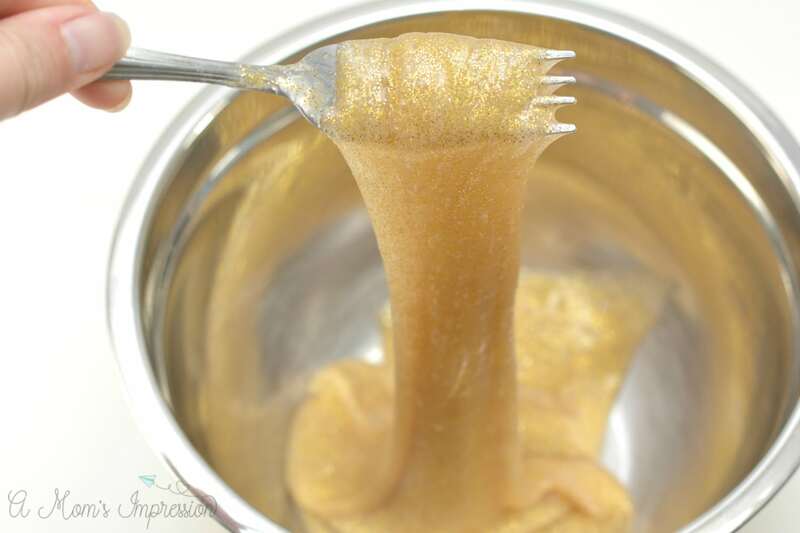 This will help to create a good, super stretchy texture for your slime. Keep stirring and adding more liquid starch until your glue mixture no longer sticks to the sides of the bowl or your hands. Pull out the slime, and work the remaining starch into it with your hands. You can wear gloves at this point if you wish. Should you use too much liquid starch, you can add a little more glue to the mixture to loosen it up a bit again. 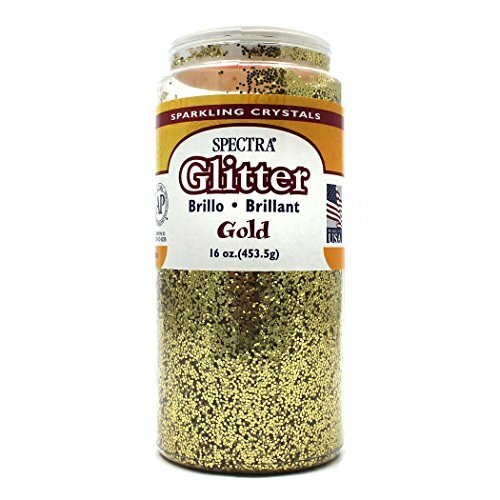 If your slime it not sparkly enough, you can also add some additional gold glitter at this time. Be sure to wear gloves, and to incorporate it into the slime well before playing with it. 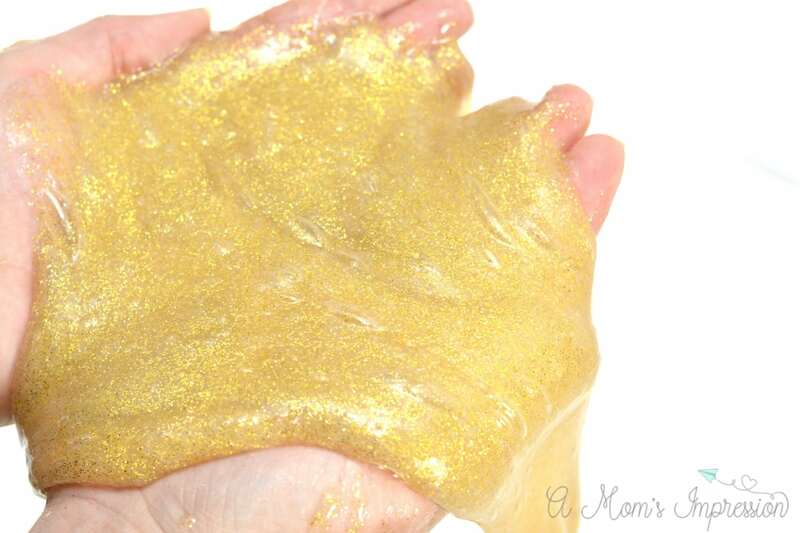 Additional glitter added to the slime will be more prone to come off on your hands during play, so be aware of this before you add any to your slime. Enjoy playing with your slime, and store in an airtight container at room temperature when finished.